Ash qualified from Liverpool University in 1992. After qualifying, he worked as an NHS dentist in Salford for 15 fabulous years. Ash then joined us at Barrington Dental Care in 2007 and became a partner in the practice in 2009. Ash is as passionate about dentistry today as when he first qualified. His special interests are in cosmetic dentistry and implants. He has undertaken the prestigious year long Tipton Restorative course, the Trafford General Hospital Certificate Implant course under the renown Implantologist Cemal Ucer, two Osteocare implant residencies, and is accredited for use of Inman Aligners and Quick Straight Teeth Orthodontic protocols. 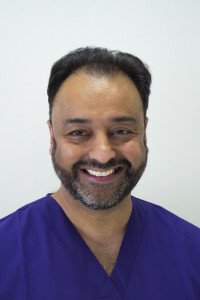 Ash has two wonderful children, Meera and Arun and a fantastic wife, Heidi, who is a hygienist at the practice. When he’s not working, Ash likes walking with his family in the Lakes and Wales. He also loves football and cricket and for his sins, supports Manchester City and Lancashire, which can be very stressful.